When listing your house for sale your top goal will be to get the home sold for the best price possible! There are many small projects that you can do to ensure this happens! 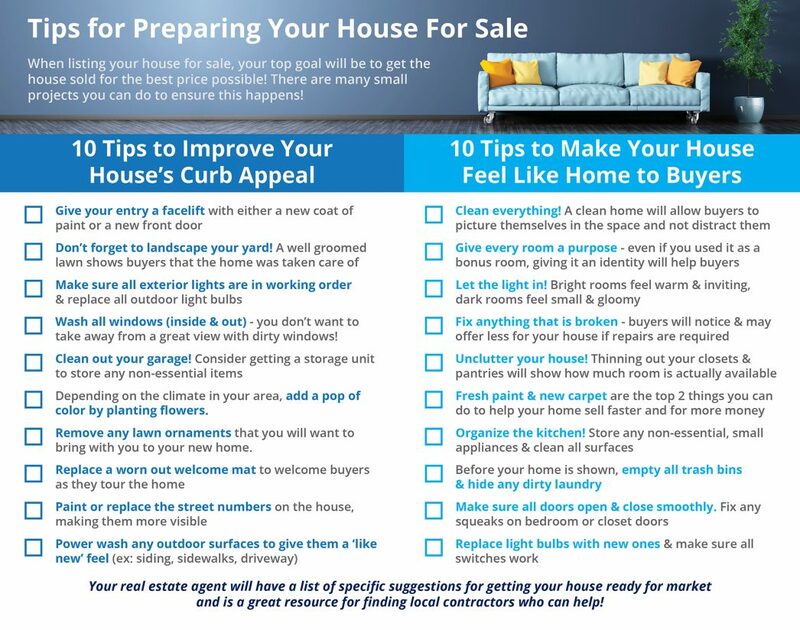 Your real estate agent will have a list of specific suggestions for getting your house ready for market and is a great resource for finding local contractors who can help! The data relating to real estate on this Web site derive in part from the Carolina Multiple Listing Services, Inc. IDX program. Brokers make an effort to deliver accurate information, but buyers should independently verify any information on which they will rely in a transaction. All properties are subject to prior sale, change or withdrawal. Neither Rinehart Realty Corporation nor any listing broker shall be responsible for any typographical errors, misinformation, or misprints, and they shall be held totally harmless from any damages arising from reliance upon this data. This data is provided exclusively for consumers' personal, non-commercial use and may not be used for any purpose other than to identify prospective properties they may be interested in purchasing. © 2019 Carolina Multiple Listing Services, Inc. Data last updated 2019-04-18T23:58:44.657. © 2019 Piedmont Regional Multiple Listing Service, Inc. All rights reserved. IDX information is provided exclusively for consumers' personal, non-commercial use and may not be used for any purpose other than to identify prospective properties consumers may be interested in purchasing. Information is deemed reliable but is not guaranteed accurate by the MLS or Rinehart Realty Corporation. Data last updated: 2019-04-18T23:55:39.083.